Rick Smotherman's anger has turned to sadness in the wake of Thursday's (Nov. 8) shooting on the Square in Woodbury. Smotherman was lucky, he says, but his 13-year-old attacker is less fortunate. The boy faces years in lock-up. The eighth-grade child attempted to rob Smotherman's store right at closing time. 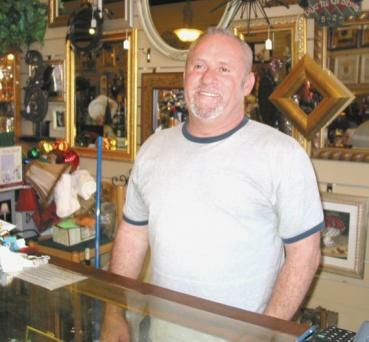 "I never dreamed that would happen, but you just never know," said Smotherman from behind the counter at Leland's Furniture and Home Décor. "I was closing up and was heading to the front door when I saw him standing there," he said. The hoodie-wearing young-ster had a pistol pointed at Smotherman. "I thought it was a toy and he was trying to pull a prank," he said. "I told him to put that thing down, but he didn't say a word. His eyes, I don't know, were just sorta glassy." Smotherman and the 13-year-old started scuffling and the clerk managed to push him out the door. The battle continued on the sidewalk, but the boy managed to break free in front of the karate studio next door. Smotherman said. "He told me to stop … It was the only thing he said. 'Man let me go. This gun's going to go off.' "He broke free. He was two or three feet away. He could have escaped,"
But instead, the boy fired the gun at Smotherman striking him in the side. At that point, the store owner still thought the pistol was a toy cap gun. "I was angry, I was upset. I felt a burning, but I didn't realize I was wounded until I reached down there and brought up a bloody hand," Smotherman said. "But it didn't really hit me until we got to the hospital. There I sorta fell apart," he continued. Smotherman doesn't really know why the boy picked his store to rob. "We really don't do much cash business. Ninety-eight percent of our business is plastic. "I would have given him the $60 in the cash register if he had asked," but given the circumstances Smotherman believes he did the right thing. "Really and truly, I'm afraid the little guy would have shot me in the head, if I had given him the money, so there wouldn't have been any witnesses," he said. But there were witnesses all up and down Woodbury's main street. The boy was even videotaped by a camera down the street. The boy and his friend had been up and down West Main Street repeatedly. They were apparently looking for an opportunity. No charges have been filed against the second boy, but the investigation by Woodbury Police is continuing. "I was the only person in the store and was closing when he stepped in," Smotherman said. At that moment, other shops on West Main were either closed or were still busy. As for his own move, "it wasn't bravery, it was stupidity," Smotherman said. "God is keeping me here for a reason," he concluded. "I hope God steps into his (the boy's) life and takes over." Excellent follow-up story. Thanks Mike! ,Wonderfully told story. What a wonderful attitude Rick Smotherman has regarding the incident.